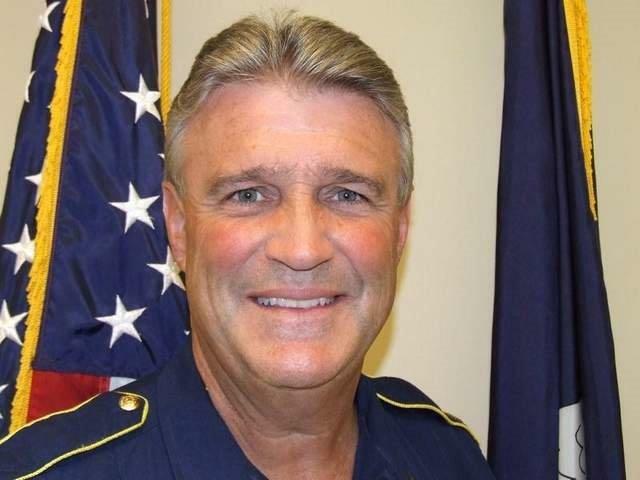 Tommy Lewis, a high-ranking state police lieutenant in Troop F in Monroe was cited by the Mississippi Gaming Commission in April of 2010 for sneaking an underage woman who was not his wife into the gaming area of Ameristar Casino in Vicksburg. He apparently did so in defiance of state law barring anyone under the age of 21 from entering the playing area, according to documents obtained from both Louisiana State Police, the Mississippi Gaming Commission, and from Warren County (Mississippi) Justice Court. He was subsequently promoted to commander of Troop F by State Police Superintendent Mike Edmonson. 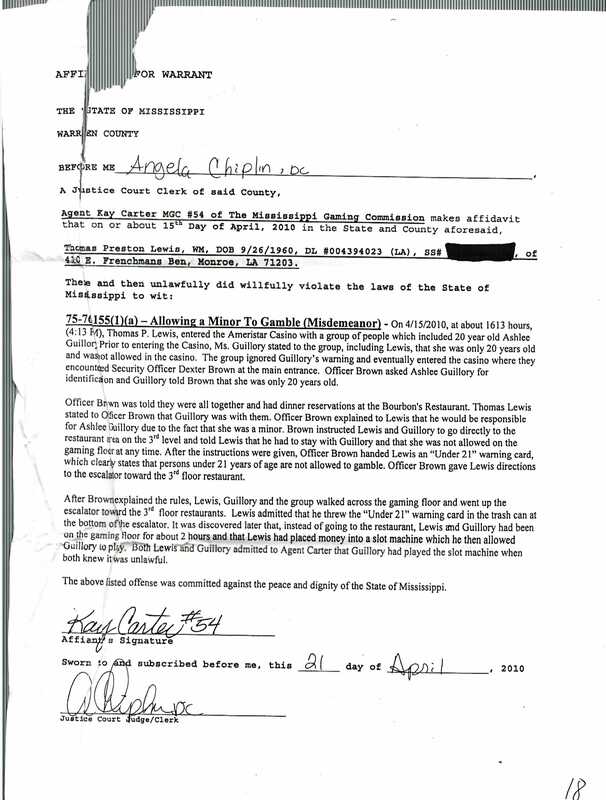 Lewis, who upon being caught, attempted to use his position as a law enforcement officer to “work something out,” was fined $627 by a Vicksburg justice of the peace and was suspended 40 hours without pay by Edmonson. A trip to Vicksburg by LouisianaVoice turned up nothing. A Helpful deputy we encountered at the courthouse there, however, made several calls on our behalf and learned that the court record had been expunged. But the Mississippi Gaming Commission in Jackson still had records of the citation and Lewis’s court appearance at which he entered a guilty plea. Those documents were mailed to us pursuant to our public records request. Expunging court records is a costly process. The person seeking the action must pay attorney fees and court costs which, together, can total several hundred dollars. 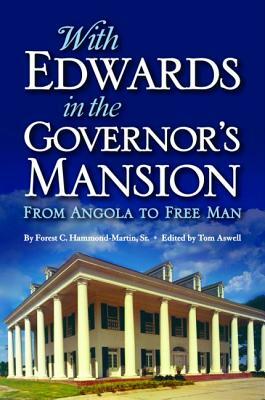 Three years later, Edmonson promoted Lewis to the rank of captain and named him commander of Troop F. He currently makes $131,000 per year in that position. Lewis was among higher ranking state police officers whom Edmonson assured legislators earlier this year would not be among those getting 30 percent pay increases as a result of two separate pay raise bills for state police passed within six months of each other. In fact, Lewis, a native of Ferriday and a distant relative of rock and roll singer Jerry Lee Lewis, went from $83,640 per year at the first of the year to $124,150 with the first pay raise on March 1 and then to his current salary on June 24, an overall pay increase of 56.6 percent. Troop F includes the 12 northeast Louisiana parishes of Jackson, Lincoln, Union, Ouachita, Caldwell, Morehouse, East and West Carroll, Madison, Richland, Tensas and Franklin. 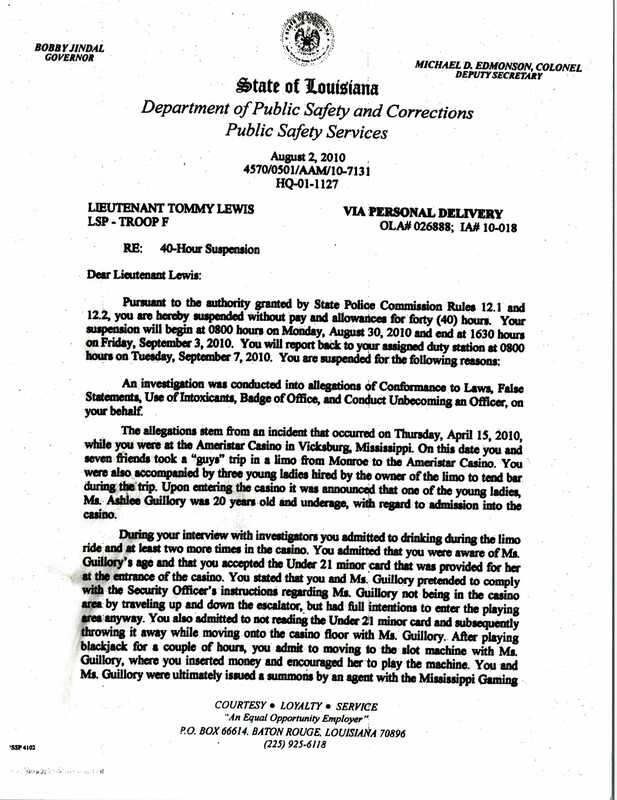 LouisianaVoice obtained a four-page letter of August 2, 2010, in which Edmonson reviewed the events of April 15, 2010, when Lewis, then making $74,200 per year as Executive Officer of LSP Troop F, traveled with seven friends by limousine on a “guys” trip from Monroe to the Ameristar Casino in Vicksburg. 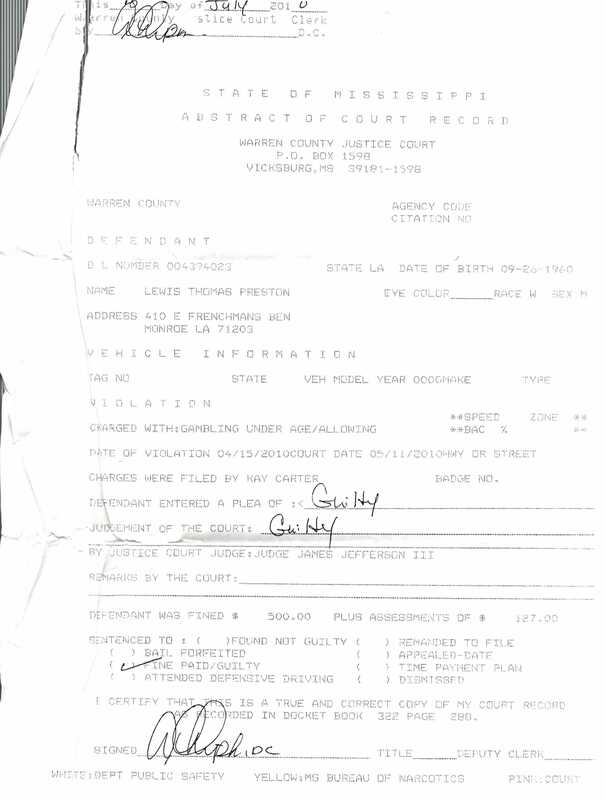 Also obtained were records of the Mississippi State Gaming Commission and Warren County (Vicksburg) Justice Court. Those records were damaged in the mail and at first, only a damaged but empty envelope was received. Days later, the damaged but still readable letter arrived. Copies of all documents may be examined at the bottom of this story. The damages to the Mississippi documents is readily discernable. A check of four separate companies in Baton Rouge and New Orleans by LouisianaVoice failed to turn up any limousine services that provide bartenders, female or otherwise. “None of the limo services that I’m aware of provide that service,” said a representative of a New Orleans limo service. “The bars in the limos are very small. That sounds more like escorts than bartenders,” she added. “Upon entering the casino it was announced that one of the young ladies…was 20 years old and underage, with regard to admission into the casino,” Edmonson wrote. Lewis would have been in his early to mid-40s at the time, according to one source. Edmonson said Lewis admitted to drinking “during the limo ride and at least two more times in the casino” and that he further admitted that he was aware that the woman was only 20 and that he “accepted the ‘Under 21 minor card’ that was provided for her at the entrance of the casino. 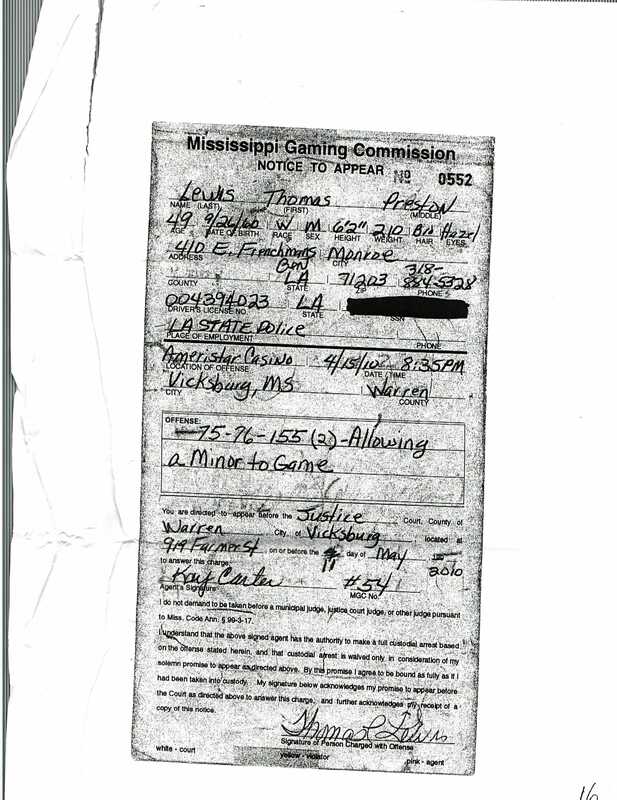 After being issued a summons by an agent of the Mississippi Gaming Commission for allowing a minor to gamble and being banned from re-entry into the casino, “it was alleged that you identified yourself more than once as the Executive Officer for LSP/Troop F to the Director of Security and to the Mississippi Gaming Commission agent while asking if there was the possibility of working something out,” Edmonson wrote (emphasis ours). “In addition to the statements you provided during the investigations, security cameras and other witnesses were able to confirm your inappropriate actions while at Ameristar,” he said. 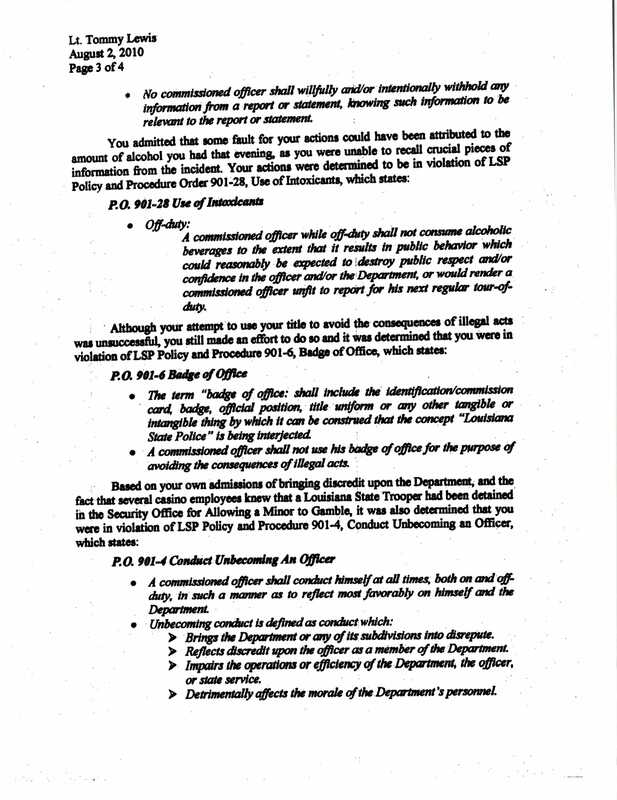 Lewis subsequently “provided an incident report to your commander which was misleading and (which) failed to contain the relevant information needed in a report of that nature,” Edmonson wrote, adding that his false statements placed Lewis in violation of LSP policy which says, “No commissioned officer shall willfully and/or intentionally withhold any information from a report or statement, knowing such information to be relevant to the report or statement.” (Emphasis Edmonson’s). “Investigators sustained all five allegations against you,” Edmonson said in his letter. Lewis was also ordered to appear before the Justice of the Peace in Vicksburg, Mississippi, where he was fined $627 for the summons he received from the Mississippi Gaming Commission. “You are hereby suspended without pay and allowances for 40 hours,” Edmonson wrote. “Your suspension will begin at 0800 (8 a.m.) on Monday, August 30, 2010, and end at 1630 hours (4:30 p.m.) on Friday, September 3, 2010. 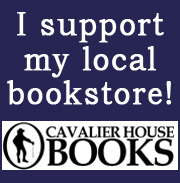 You will report back to your assigned duty station at 0800 hours on Tuesday, September 7, 2010. Wow! I had no idea state employees made so much money. I can’t remember when we retired Louisiana state employees had a cost-of-living raise. Let’s not forget, State Police personnel recently received raises averaging 30 PERCENT, paid for with money that has yet to be raised, while the classified workforce received one four percent merit increase during the jindal years. And the lil bitty one percent COLA proposed for retirees – paid for by a LASERS fund and not the state general funds – was denied. This Louisiana news just gets “better and better.” Thank you, Tom. 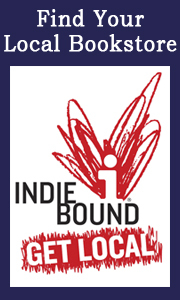 I’ll be sharing this. 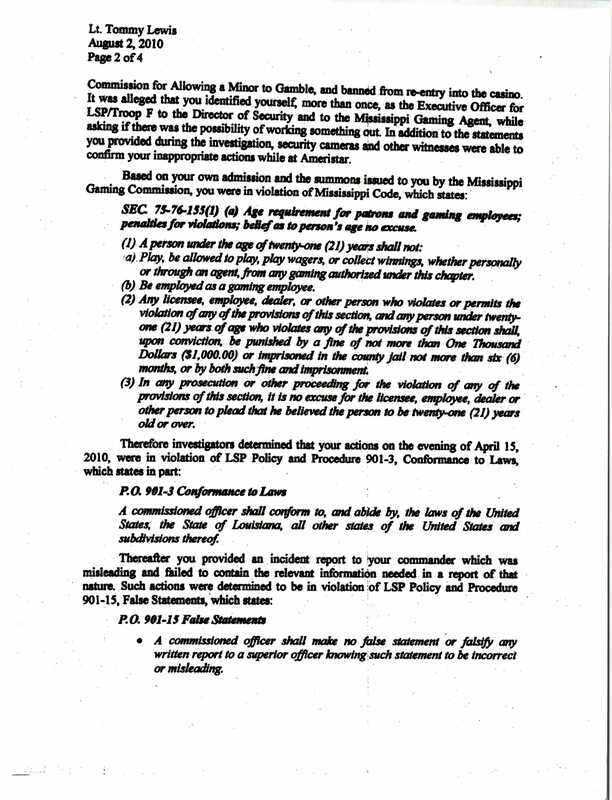 Lewis was operating a deep undercover sting operation in concert with Mississippi state law enforcement (and with Edmonson’s full knowledge) to determine the diligence with which Mississippi law regarding underage gambling was being enforced, particularly with regard to Louisiana residents visiting Mississippi casinos. Col. Edmonson’s letter and Lewis’ suspension were a smokescreen to ensure the true nature of the operation was never revealed. The “bartender ladies”, including the 20 year old, were actually CIs borrowed from ATC. The rented limo enhanced the illusion that these were some rich good ole boys from Louisiana visiting the casino with their “dates”. Tom, you should be ashamed of yourself for setting back this important area of law enforcement by blowing the cover on this operation. Now, just think how many real 20-year-old limo bartenders will be able to gamble in Mississippi with abandon. We have a culture of corruption in this state. When are we going to clean house? Abusing drugs and lying about it. Sneaking into a casino with under aged girls and then lying about it. Then you get promoted captain of a state police troop where you arrest other people for doing the same thing? No wonder crime doesn’t pay (unless you do these thing while being a state trooper). Privilege has it’s rewards. No?! Hard to expect no one to notice though. Even at that, had it not been for Louisiana Voice and a few other bloggers you wouldn’t have heard a word about these issues. 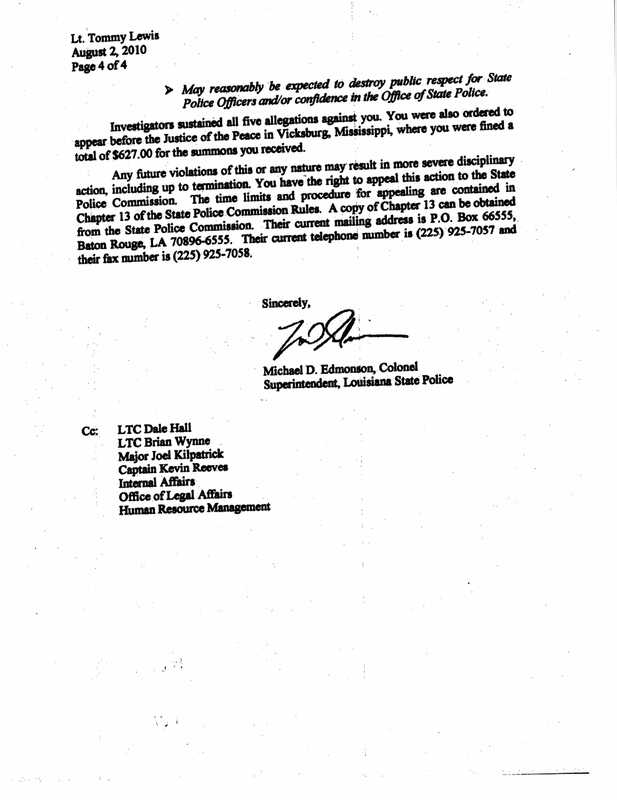 Meanwhile, a confidential report prepared for legislators has been obtained by LouisianaVoice which indicates that despite State Police Superintendent Mike Edmonson’s claim last January that the pay raise would not affect “upper echelon” personnel, 145 lieutenants, captains, and majors got pay raises totaling $5.3 million per year. Additionally, four deputy superintendents received raises averaging $26,170 (23 percent) each. Seven pilots ($29,769, or 39 percent), 24 emergency services personnel ($31,247, or 45 percent), two polygraphists ($33,995, or 49 percent), and six support personnel ($25,309, or 31 percent) also received pay hikes. The breakdown shows that 13 majors and 106 lieutenants received 46 percent pay hikes and 26 captains got bumps of 53 percent. The average salaries ranged from $108,571 for lieutenants to $136,333 for captains, the report indicates. The largest individual salary increase was $57,252 and the largest single percentage increase was 74 percent, the report says. Altogether, 945 state troopers, ranging from cadets to majors, accounted for more than $20 million in pay increases, thanks to two measures passed by legislators six months apart in 2015. Am I the only one that surmises that just a whole passel of LSP Officers will be unemployed shortly after John Bel Edwards inauguration? And as for those raises that the Legislature was promised would be (as Jindal would say) Revenue Neutral, roll them all back and start with a fresh LSP pay scale that is fair, reasonable and affordable. It appears clear that the entire LSP organization is so out of control that it is incapable of healing itself. Bring in a strong and vetted outside leader and set this ship upright again. One more example of Mike Edmonson turning this once unblemished agency into a political machine for his benefit. I wonder how many more cover ups and embarrassments are out there. Governor elect this is your chance to show us your West Point Honor Code and not fall to the political influence of the Louisiana Sheriff’s Association! All five of the allegations sustained against Lewis are things that Edmonson does himself on a near weekly basis. Very few personnel in LSP have as many disciplinary actions against them as Edmonson does and he ended up becoming the Colonel so it is no big surprise that Lewis ended up being promoted to Captain and given a command. I would be willing to bet the farm that Lewis was considered an asset to Edmonson in some way totally unrelated to LSP or knew some good dirt on Edmonson which is not that hard to do. That is why he ended up being promoted after this incident. Being deserving is not part of the equation in the Edmonson regime. However, the Louisiana Sheriff’s Assn. wants Edmonson to stay on as Colonel for their own self serving personal agenda. It is a den of snakes. Let’s hope that John Bel Edwards is more objective and smart enough to not let that happen and will ensure that his replacement does not come from some of Edmonson’s inter-circle or it will be business as usual. The really sad thing is the vast majority of the troopers and civilian employees over at DPS/LSP are decent, objective and dedicated but have had to hold their nose to go to work each day for 8 years now and be subjected to this type of double standard and be forced to function without any real leadership. Edmonson is so lacking in leadership ability that he really thought that if he could get them paid enough salary they would be happy and forget about all that silly stuff like honor and integrity. He was wrong. Yet he loves to get up in front of people and the cameras and whine about integrity and not tarnishing the badge. He is a first class phony and showman. 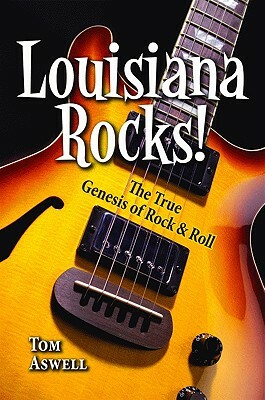 Let’s hope that John Bel or at least someone on his staff is reading Louisiana Voice and taking notes. There are some monumental house-cleaning chores that need to be done after he takes the oath of office. Wow!! Great investigative journalism Tom!! Legislators who pushed these pay raise bills are complicit. Is there a list of names of the legislators who sponsored the LSP pay raises and who voted for them? We should question their motives in this scandalous scheme!! Don’t forget about Chris Guillory at Troop D. I hear he is targeting everyone he thinks may have talked to anyone about his crimes. He is writing up and investigating troopers right and left for very minor incidents. I also heard that he wrote up one of his own troopers because several refused to accept overtime pay for assisting with S/T Steven Vincent’s funeral. Would love to see that explanation.